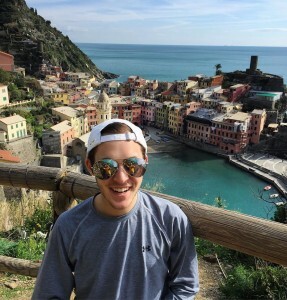 My name is Nick Coulson and I am thrilled to be sharing all of my experiences in Rome and beyond with you this semester! I am a sophomore at Loyola University Chicago where I double major in Broadcast Journalism and Political Science. Having never left the United States before and armed with only an Italian 101 knowledge base of the language, I promise this Grand Rapids, MI native’s blog will never have a dull moment. For this blog post, I figured I would let you all in on the exciting European travels I have been able to take part in so far! The first trip I took was to Dublin, Ireland in order to explore my Irish heritage a bit. I went with my friend Nick and we had a pretty open agenda for the weekend aside from our Jameson Whiskey and Guiness tours we signed up for. My first thought after stepping off the plane was…cold. We were certainly not in Italy anymore. We first met our Airbnb host’s girlfriend at her café to retrieve our key to the home and then set off to explore the city centre a bit. The first thing we did was indulge in a big, meaty burger and hearty pint of Irish beer. I figured my ancestors would expect nothing less. Italian cuisine is great and all, but all they eat are carbs and starches for every meal. Following this, we walked along the river and took in our surroundings. Ireland was a great change in pace and scenery from Rome. Overall, things were just much more casual and I loved that. The timing of our visit happened to be during what seemed to be the equivalent of the World Cup. The pubs were packed with fans. We found ourselves caught up in the excitement of it all as we visited different pubs and listened the Irish music playing in the background. It was an absolute blast. We finished our day by meeting up with three of my close friends from high school who are all studying abroad in Maynooth, a city just outside of Dublin. The next day was our tours. We first walked through the expansive Phoenix Park before making our way to Jameson. Nothing like a little whiskey at 11:30 in the morning to get your day going. We followed the Jameson tour with the Guinness tour, which proved to be a great time as well. We learned the process that goes into making the beer, how to properly taste the beer and finally how to pour the perfect pint. I am proud to say that I passed out of the Guinness Academy and can now craft the “Perfect Pint”. The remainder of the day included more delicious Irish food and beverages, a walk through Temple University and a stroll around Dublin Castle. The next trip I took was to Budapest, Hungary with seven friends. Our first stop en route to the apartment was Starbucks! Now don’t get me wrong, Italian coffee is some of the best around, but this American gold card member missed the mermaid a bit. Hungary operates on the forint as opposed to the euro, and it is essentially monopoly money. What I mean by this is that my grande Starbucks latte came out to around 1,100 forint. When we would get our checks for meals, they would be upwards of 10,000 forint. Although it seems like a staggering amount, food and drinks were quite cheap there. You could get a main dish, side and a beer for about the equivalent of $7.00. My bank account liked this trip. One of the first things we noticed was that the Hungarians didn’t really seem too fond of us Americans. Some of the employees at the stores and restaurants would be totally rude to us and then completely different to the Hungarian behind us in line, so that was interesting. The nightlife in Budapest was so much fun though! Our first night we went to these bars and clubs that were created in old, bombed out buildings from war activity that had taken place there. The following day we woke up, grabbed some Subway (we missed our American food, okay?) and headed to a free walking tour of the city. The tour took us to some of the prettiest lookouts in Budapest, all the while teaching us some really interesting facts on the history and current state of the city and country. The next day we went to one of the largest thermal baths in Budapest. Thermal baths are essentially massive hot tubs, and Budapest is very famous for them. This particular complex had two large out door ones in addition to several smaller ones indoors. It might seem a little gross, but it was actually so relaxing and all of us really enjoyed ourselves there. Following this, I visited the House of Terror, which is a museum with exhibits related to the fascist and communist dictatorial regimes that existed in Hungary during the 20th century. The basement of the building has the cells where victims of the regimes were held, interrogated, tortured or killed. It was a very eye-opening and informative experience. My next trip took me to the beautiful city of Amsterdam, Netherlands with six friends. This was one of my favorite trips up to that point. This trip also happened to be my first time staying in a hostel and it was…interesting. Okay, so it wasn’t bad by any means, but it is definitely different sharing a room with 19 other people. After getting settled in at our hostel, we set out to go venture through the city. One of the first places we stopped at was the iconic bench from the movie “The Fault in our Stars”. We then grabbed some dinner and prepared to take on the night. For those who are not aware, Amsterdam is a city where a lot is legal including marijuana and prostitution. One of the famous neighborhoods of Amsterdam is the Red Light District where you can find rows and rows of scantily clad women standing behind glass doors, tapping on their windows if they like you and trying to get you to make a deal with them. Rest assured, I did not take part in any dealings but it was still an interesting visit. That night ended with some fresh churros sprinkled with powdered sugar and drizzled in Nutella. The best desserts ever can be found in Amsterdam. We woke up early the next morning to get in line for the Anne Frank House. This was probably my favorite thing I have visited since being abroad. You got to walk through the annex where they lived in hiding for over two years. The original bookcase that hid the entrance was still there, the pictures Anne cut out from magazines and stuck to her wall were still hanging up, you could see up into the attic where her and Peter would sometimes go and look out the window when it was safe to do so and at the end you got to see the original diary Anne wrote in. It was a very moving and emotionally draining experience. I got chills every time I walked into a new room. After this, we walked down the street to indulge in the best pancakes ever. The remainder of that day included walking through an Amsterdam market, taking a canal boat tour and getting some waffles with ice cream and Nutella on them (these desserts though…). Our final day in Amsterdam took us to the area of the Rijksmuseum and the Van Gogh museum (we didn’t go in either because we were broke. The desserts didn’t come cheap) where the famous giant metal iamsterdam sign is located. We took some pictures there, walked through a nice park and headed back to Rome. My most recent trip was easily one of my favorites, Spring Break with the family. My dad, brother, cousin and uncle came to visit and do some Italian travels. 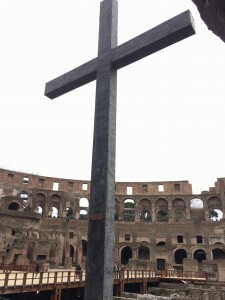 We spent our first few days in Rome doing the Scavi Tour (contains the tomb of Saint Peter), a tour of the Vatican Museum and Sistine Chapel, visiting St. Peter’s Basilica, walking by the Colosseum, visiting the Trevi Fountain and Pantheon, and wandering into the many churches in Rome. Our next stop was Positano in the Amalfi Coast. We did a private tour that took us to some of the prettiest lookouts of Amalfi and the surrounding areas. Our villa was located towards the top of Positano, which made for a pretty lookout from our rooftop terrace, but a terrible walk back up from the beach-front restaurants at night. It is still considered low season for these touristy areas so we had the town primarily to ourselves. After spending two nights here, we made our way to the beautiful city of Florence. We spent some time haggling in the leather market, climbing to the top of the Duomo and Cathedral of Santa Maria del Fiore, visiting some of the Jersey Shore season 4 sites (they filmed that season in Florence and my reality TV junkie self was dying), walking across the Ponte Vecchio and looking at the many sculptures scattered throughout the city. Our last stop took us to the town of Monterosso, one of the five towns that are a part of Cinque Terre. We were blessed with a beautiful day for doing some hiking. Cinque Terre consists of five towns and the thing to do is hike to and explore each of the towns. Because we only had one shortened day, we only hiked to the neighboring town of Vernazza. Once our tired and sweaty selves made it, we grabbed some pizza and a cold drink and sat by the water to take in the view. I can’t say that I am Mr. Outdoorsy by any means, but the hike was incredible. (And I only took a huge fall in front of people once! Yeah, coordination isn’t necessarily my strong suit either…) The next day we took the train back to Rome and I had to say goodbye to my dad and brother after an amazing week filled with so many laughs and memories that I will cherish forever. I am so grateful to both of my parents who have allowed me to embark on this crazy semester-long journey! I’m so glad I was able to give my dad and brother a small glimpse into what I have been fortunate to be living in for the past two months. Italian Fun Fact: Italy is not a tipping culture. The price you see is the price you pay at the end of a meal or service. As I mentioned before on my last blog post, I don’t have any classes on Mondays, so I took advantage of this and explored downtown Rome with my friend Alanna. We started our day in a great shopping district doing some window-shopping and looking at all of the deals. (No mom, I didn’t cave in and buy anything. I hope you are proud of me.) After strolling for a bit, we sat at the bar of a café and ordered ourselves a cappuccino. The cappuccinos here are incredible and at €1-€2, you can’t go wrong. 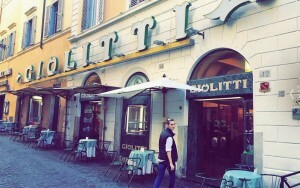 Not sure how I’m supposed to return to Starbucks and their prices after this… Following our cappuccinos and some more walking, we went to my favorite geloterria yet, Giolitti. I got fragola (strawberry), caramel, and Oreo cookie. Each flavor was soooo good. We took the gelato to go and ate it outside of the Pantheon while people watching and listening to some street performers. After walking through the Pantheon, we made our way to another café and each picked ourselves up a panino to eat outside in the sun by the Spanish steps. Tuesday was another day of classes and another night at Scholars for some karaoke. I sang some killer renditions of “Party in the U.S.A.” and “Ignition (Remix)” with friends. Both were a smashing success. LILY UPDATE: For anyone who tuned into the blog last week, you might remember the girl Lily who I had met at Scholars last time and who bought me shots because she thought I was Jack, a son of one of her mom’s co-workers. Well, the night was going great and just as we were walking out the door I hear a, “Hey! You told me your name Jack!” Uh-oh… With the help of my friends, we were able to convince her that my name was ALSO Jack Moorev (convenient, right?) and I also knew a Lillian that was in Rome. Her and all three of her friends bought it. Hopefully this will be the end of Lily updates for a while. On Wednesday, I attended the mass of the Holy Spirit at one of the most beautiful churches in Rome with numerous classmates. This is a JFRC tradition that sort of signifies the end of orientation and the official beginning of our semester. This church was beautiful. I truly wish there was a way I could even begin to describe it. Following mass we went out for an Italian meal. The four-course meal had two standout parts for me. The first would be the pear pasta that we were served. Pear pasta you say? Yes, you read that correctly. It was these noodles stuffed with some sort of pear puree and doused in a pear infused alfredo sauce. It was incredible. My other favorite part of the meal was the gelato we were served for dessert. They described it as a sort of truffle gelato. The outside was covered with espresso bean powder, and then a chocolate layer and inside of that was a vanilla layer. So so good. Thursday was my first on-site class. The JFRC offers several partially on-site classes, meaning we go to various sites within Rome or even further away in order to compliment our in-class lectures. On this particular morning, I traveled to Ara Coeli, another one of the many beautiful churches in Rome, for my Writing Fiction in Rome class. This particular church hosted the Santo Bambino, a wood carving of the baby Jesus all dressed in jewels. People from all over the world will write letters to the Santo Bambino. He is especially prayed to for healthy pregnancies. After this we walked around the neighborhood we were in. That night I booked another trip. I will be Barcelona bound in April! I am so excited for the opportunity to explore yet another beautiful city and country while abroad. This particular weekend was everybody’s first real chance to travel. However, some friends and myself were the minority that remained on campus. This gave us a great opportunity to catch up on sleep, get ahead on homework and explore the beautiful city of Rome even more. We went downtown, had some McDonalds (the menus here are different and SO much better… America needs to step up its game), ate gelato and finally made it to the Trevi Fountain. Throwing a coin in your right hand over your left shoulder and into the fountain ensures that you will return to Rome again in the future. Let’s hope! We also booked two more trips over the weekend. I will be heading to Dublin this weekend and Amsterdam later in the month.